This is Mumford and Sons on the final gig of the Railroad Revival Tour, at Woldenberg Park; New Orleans, on the 27th April 2011. The band consists of Marcus Mumford (vocals, guitar, drums, mandolin), Ben Lovett (vocals, keyboards, accordion, drums), "Country" Winston Marshall (vocals, banjo, dobro), and Ted Dwane (vocals, string bass, drums, guitar). The band formed in October 2007, rising out of what some in the media labelled the "West London folk scene" with other artists such as Laura Marling, Johnny Flynn and Noah and the Whale. 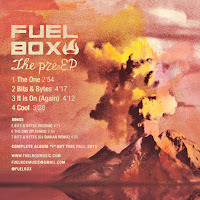 Background:Fuel Box is a Soul/Dub/Blues/Hop-act from the Netherlands that delivers raw, psychedelic but melodic beat songs. Kind of a mixture between Madlib, The Black Keys, Wu Tang Clan, Bill Withers, Lee Perry and Prince. They generate a sound that is best described as if a 60's Soul singer and a latter day hip-hop producer cut an album together in 70's Jamaica. It all started out with singer Remy Britsemmer and producer Josh Boon but today it's a fully operating and functioning live-band. Now they released a Free EP, called "The Pre-EP". It's the preview for the complete album "1" coming out this fall, 2011.